Friday - Due to extreme heat warnings, the tour has been suspended for a few days. We were bussed through Phoenix to our Monday night stop in Payson. We'll be resuming again on Tuesday morning. Although it's a little disappointing that we won't be able to bike the entire way, driving through what would have been our Monday ride, it's very unlikely I would have made it the whole way in this heat. The view was breath-taking by vehicle, but the long hard climbs followed by steep declines would have been very grueling. 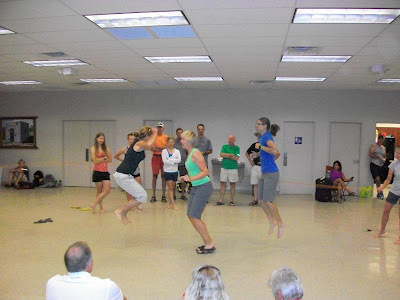 The temperature here is a cool, comfortable 30 C.
Instead of cycling, we entertained ourselves with hola-hoops, jump ropes, and euchre games.